Last week we focused upon the fruit of “patience.” We learned that if you dig around the root system of patience, you will find deep compassion for others. And the more we exercise compassion for others and empathy with others, the stronger they become – after all, whatever we exercise tends to grow stronger. That’s an important lesson, and it helps us bear the fruit of patience, which is evidence that the Holy Spirit lives in us. Some versions of the Bible translate “kindness” as “mercy.” I find it interesting that justice and mercy are twin requirements of the Lord, and I look forward to Sunday as we explore the relationship between the two and the resulting fruit of kindness. Speaking of Sunday, I remind you that the third of our four educational forums on prayer is set for this Sunday evening in the Moore Chapel at 6:30 pm. This week our instructor is Dr. Tom Elliott, Associate Professor in the Practice of Practical Theology at Candler School of Theology. He will be teaching on the topic “Prayer: An Expression of Recognition.” Tom is a gifted teacher and he will offer some very practical instruction to help you grow deeper in your relationship with Christ through prayer. I strongly encourage you to take advantage of this opportunity. Last Sunday in worship, we heard from Brett Hillesheim, a fellow United Methodist who works with the United Methodist Children’s Home. Brett shared how he and his wife heard a call to serve as foster parents, responded to that call, and have offered love and support to over a dozen children in the last few years. They found the support of the United Methodist Children’s Home to be vital as they never were without diapers, respite care, children’s clothes, help with birthday parties, or anything else they needed. Our giving to the annual special offering for the UMCH makes a difference, and he was present Sunday to say “thank you.” Now I want to “thank you” for your generosity as you gave nearly $12,000 last week to help foster parents like Brett. If you would like to contribute, it is not too late. Please give through the church app or online. Earlier this week, we received notice that Peachtree Road has been chosen as the 2018 Washington Cluster Partner of the Year by Atlanta Public Schools for our work with Hollis STEM Academy. I am so grateful for Beth Spencer on our staff and all those from our church who have worked in the trenches to support the teachers, administrators, students, and parents of Hollis. You are making a significant difference on the Westside! Imagine Capital Campaign — In late June, I announced we had received $1.5 million in gifts and commitments so far this year toward a $2 million matching gift that will enable us to retire our debt. Stated another way, we were $500,000 away from retiring all debt, avoiding future interest payments to the bank, and ensuring that more of our giving supports the vital ministries of this great church. I announced that I was looking for 500 people who were willing to give an extra $1,000 during 2018 to help us achieve this goal. Well, you have responded most generously, and we now stand approximately $92,000 away! We can see the finish line, and I hope you will help us get there! If you would like to be one of our 500, please make your check payable to Peachtree Road UMC and mark it “Imagine Debt Retirement” or make your gift online through the church app or website giving to “Imagine.” If you would like to make a gift of stock, please contact our COO Raymond Reynolds here at the church. 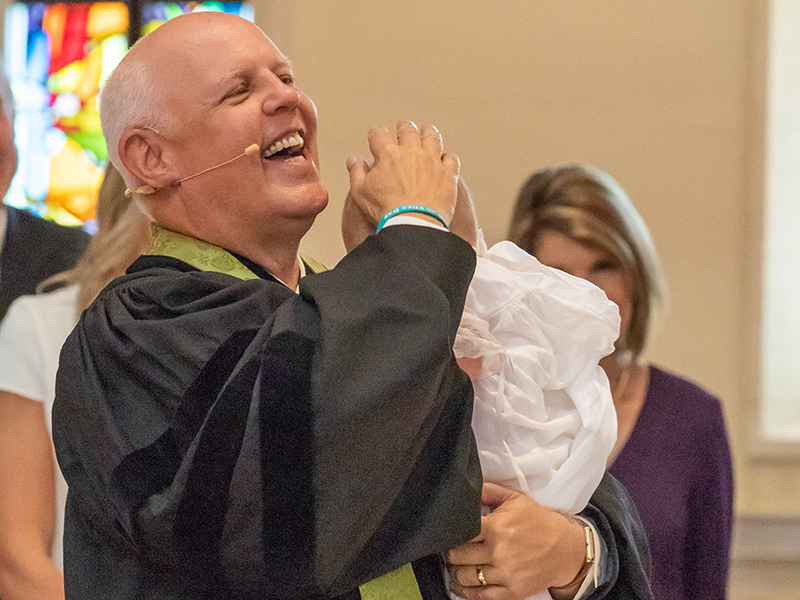 2019 “All In!” Campaign – The fall is stewardship time here at Peachtree Road. During the next three weeks, you will hear words of testimony and encouragement from fellow members as we make our pledges to the 2019 operating budget of the church. Your giving sustains our ministries of worship, nurture, outreach, and witness, and helps us care for our facilities. I do hope you will decide to be “All In!” in 2019 and make a pledge to support your church with your prayers, presence, gifts, service, and witness. Please know that I am grateful for you. (You may wish to make your pledge now through the church app or website). Thank you for your attention to this important spiritual matter. As you can see, these are good days at Peachtree Road. Thank you for your service to Christ through this great church. If I may be of help to you, please do not hesitate to reach out to me.